Chromium allergy is a skin disorder that affects between 1 and 3% of the population. Hypersensitivity to metals (Nickel, Chromium, Cobalt …) is widespread even though many people do not know they are allergic. In most cases harmless, Chromium allergy can become bothersome and sometimes even painful. The symptoms are varied (rashes, redness, pimples…) and can be localised on a specific area following contact with the allergen or generalised all over the body. It is most often referred to as allergic contact dermatitis. The area that is in contact with the object containing the Chromium to which you are allergic will react. Dry skin, rash, severe redness, discolouration of the skin, or fluid-filled blisters that can cause crusts and dander… are all symptoms of Chromium allergy. How can Chromium allergy be relieved? Skintifique has created the world’s first products that effectively protect skin from irritant metals such as Chromium, Nickel and Cobalt. They benefit from an exclusive patented technology called “Capturifique”, which captures Nickel and other irritant metals at the surface of the epidermis, limiting their penetration into the skin as well as the harmful effects. Thanks to its patented technology, Capturifique, Skintifique has developed the first skin care products in the world that protect skin from Chromium. Protects skin from Nickel for up to 14h. Moisturises intensely. Cleanses softly. Proven efficacy. Very safe & pure formulations. Protective moisturiser: protects skin from Nickel. Proven efficacy. For body and/or face. Safe & pure formulation. Gentle cleansing and purifying micellar water, makeup remover. Removes impurities and traces of Nickel. What are the results of Skintifique products on Chromium allergy? 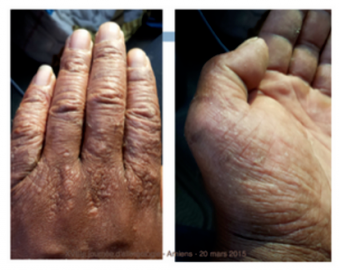 Below are photos of a 38 years old paver forklift truck operator who suffers from contact dermatitis caused by his Chromium allergy. He is in contact with Chromium as part of his professional activity. 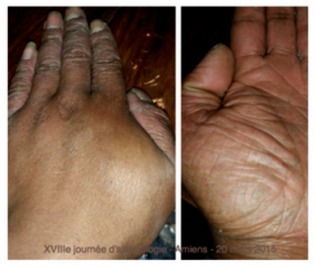 2 weeks after starting to use the Protective Cream HPS at work during the day, and the Hydrating Gel Plus HS at night, his hands have regained a normal aspect. Allergic or hypersensitive, looking for Chromium Free accessories?